Map: Microsoft Map program The Global Flyways Conference was held in Edinburgh 3-7 April 2004. I decided to spend a week touring Scotland before the conference. 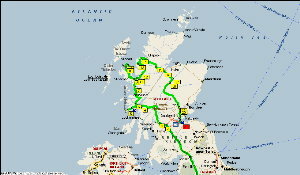 I flew to Manchester where a friend, Hanri, picked me up on 28 March and we drove a circular route (green line on the map. Photo H.D. 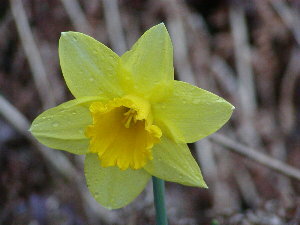 Oschadleus Hanri, in the Scottish highlands. Photo H.D. Oschadleus We drove through Glascow, where I noticed Daffodils flowering everywhere. In most towns and cities we drove through we found the same. 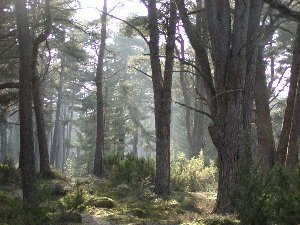 A few trees started showing spring flowers, but there were no leaves on any decidous trees yet. Photo H.D. Oschadleus Our first scenic stop was at Loch Lomond, the largest freshwater body in the UK (35 km long, 8km wide). 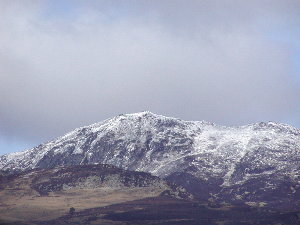 Ben Lomond in the background. Photo H.D. Oschadleus By evening we reached the town of Oban (meaning "little bay"), a coastal town. 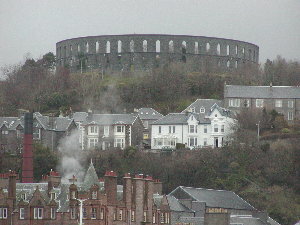 On the hill-top is McCaig's Tower, an eccentric colosseum-like structure built in the 1800s. Photo H.D. 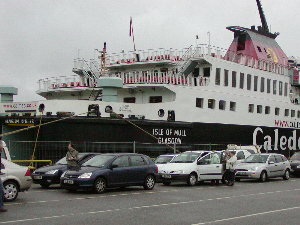 Oschadleus Oabn is the "Gateway to the Isles", so the next morning we drove onto the ferry to take us to the Isle of Mull. Hanri is standing behind his black Honda. Photo H.D. Oschadleus We spent most of the day exploring the Isle of Mull. 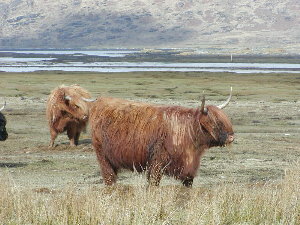 There were Highland cattle and sheep. Photo H.D. 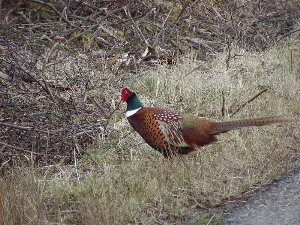 Oschadleus Male Pheasant on the Isle of Mull. We spotted 24 bird species on the isle, including one of the introduced Sea Eagles - it flew low over the car and circled above us. Photo H.D. Oschadleus In the afternoon we took a ferry to the mainland and drove to Mallaig. 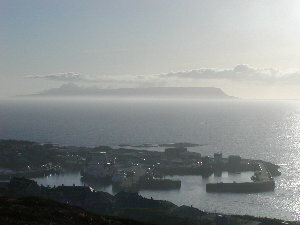 I did the circular walk overlooking the harbour. Photo H.D. Oschadleus The next day we took the ferry from Mallaig to the Isle of Skye. 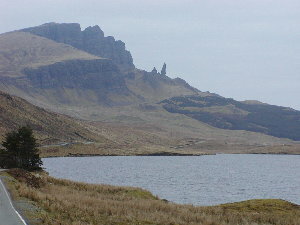 The Storr, a basaltic plateau, is in the northern part of the isle. Photo H.D. 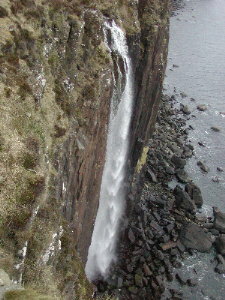 Oschadleus Kilt Rock Waterfall on the Isle of Skye. 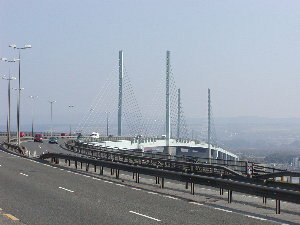 The name comes from the cliffs which are made of hexagonal basalt columns which resemble the tartan pattern of kilts. 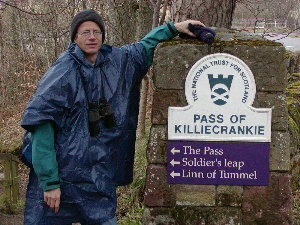 We also visited the Kylerhea Otter haven on the isle, but unfortunately did not see any wild otters. 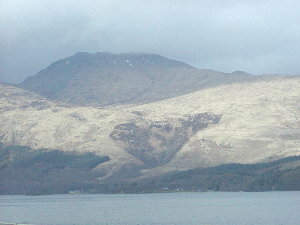 We drove to the mainland via a bridge, and overnighted at Lochcarron on Loch Carron. Photo H.D. Oschadleus On Wednesday we drove along the Wester Ross Coastal Route. 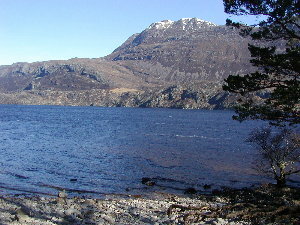 One of our stops was at Loch Maree in the Beinn Eighe Nature Reserve (Britain's oldest wildlife sanctuary). This is typical scenery - blue lochs, and mountains with snow on the peaks - but we did not tire of the beauty. Photo H.D. Oschadleus We stopped at several places along the coast, looking for seabirds. 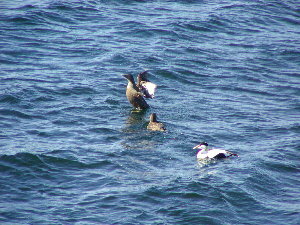 These are Eiders (sea ducks) at Gairloch pier - male on right front and 2 females. Photo H.D. Oschadleus We saw lots of streams and rivers. 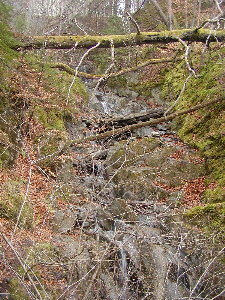 Rogie Falls is on the way to Inverness. Walking along the river we found Grey Wagtails but no Dippers that I was hoping to see. Photo H.D. Oschadleus Our next stop was at Loch Garten Nature Reserve, a woodland area around Loch Garten. There is an Osprey Centre that has a video camera observing the Osprey nest, but the Ospreys were not back from their migration to West Africa. 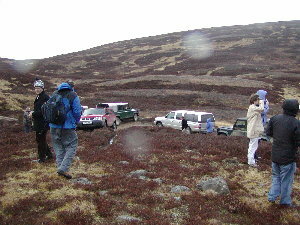 We drove on to overnight at Kincraig, next to Loch Insh and the Spey River. Photo H.D. Oschadleus On Thursday 1 April we continued our journey south. 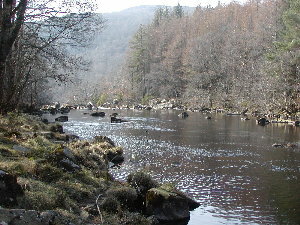 We stopped at Killiecrankie to walk along the river for a few hours. We had great weather for our first few days but a cold front was approaching, and from this day we had some rain for the next week. Photo H.D. 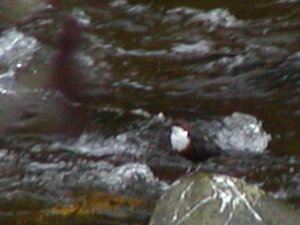 Oschadleus As we walked reached the Gary River on the Killiecrankie walk, we saw Dippers. These are passerine birds that swim underwater to feed on aquatic insects. This one is sitting on a rock (the contrast may not be clear on some computer screens but its fine on mine). Photo H.D. Oschadleus Small side stream running into the Garry River. After our hike, we drove to Perth but found a BnB at a village, Earn of Bridge, ouside Perth (cheaper than in the city). Photo H.D. Oschadleus On Friday Hanri dropped me off at the Heriot-Watt University in Edinburgh, where the conference was to be held. The university has a great conference centre, a woodland garden, and a small lake. 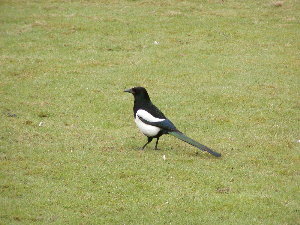 There were lots of birds to be seen, including this Magpie. Photo H.D. Oschadleus On Saturday was registration day but there was time to take a bus to the city centre. 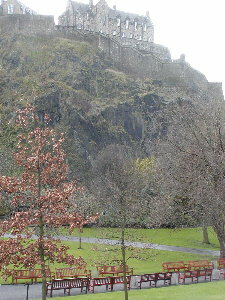 Edinburgh Castle on top of Castle Rock is more impressive than the photo shows. Photo H.D. Oschadleus Edinburgh Castle at the start of the Royal Mile, which runs up to Holyrood Palace. 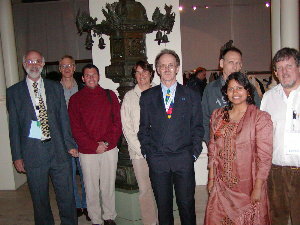 Doug Harebottle, John Cooper, Aeshita Mukherjee (and me behind the camera). 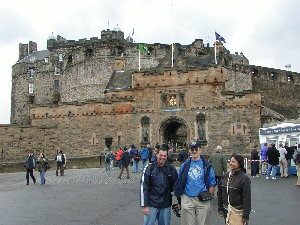 We explored the Royal Mile up to North Bridge before slowly returning for our evening function. Photo H.D. 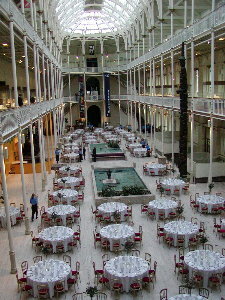 Oschadleus The conference delegates were invited to dinner at the Royal Museum in Edinburgh. We were taken on a short tour of the bird section of the museum before being seated. Photo H.D. Oschadleus There were about 6 poster prizes, two being awarded to ADU staff, ie. Jenny and Aeshita. Jenny's penguin poster. Photo H.D. 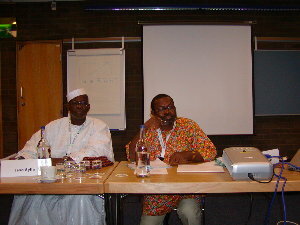 Oschadleus There were several talks and side meetings relating to Afring (ringing in Africa). 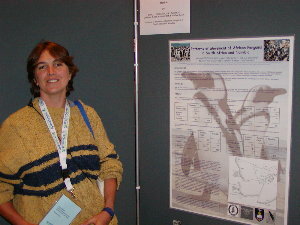 I gave an overview of waterbird ringing in Africa in the Intra-African migration symposium, chaired by Issa and Gus. Photo H.D. Oschadleus On Tuesday there were excursions. I went with an excursion to an upland estate at Blair Castle. 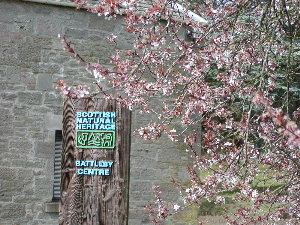 En route we stopped for tea at Battleby centre, one of the few places where I found spring flowers on a tree. Photo H.D. Oschadleus We passed the Cairngorm Mountains, where there is a skiing resort. Photo H.D. Oschadleus The Blair Castle (a 17th century Later Tower-house type of castle) on the Blair Atholl estate. 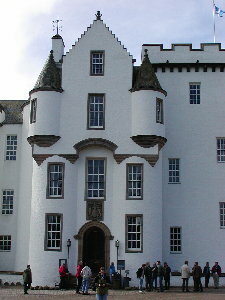 The castle is filled with antlers, family portraits, antique furniture, swords, etc that were collected by the Blair family over the centuries. Photo H.D. Oschadleus After the castle tour, we drove into the highland part of the estate. 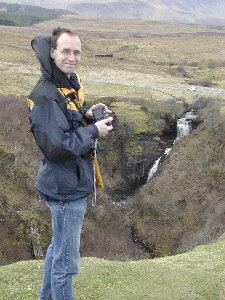 It was very cold, with patches of rain (note the raindrops on the camera lens). We still saw some birds, like Peregrine flying over. Photo H.D. Oschadleus On the last day of the conference, John Cooper gave a plenary on albatrosses and long-lining. 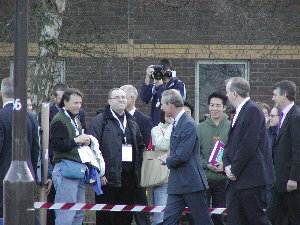 Prince Charles of Wales attended this plenary, and then addressed the audience on the same issue and on some North Sea conservation issues. Here he is leaving the university. Photo H.D. Oschadleus That evening was our last get-together at the university in the form of a Ceilidh, a Scottish type of barn dance. 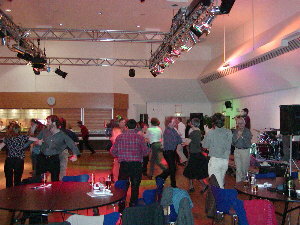 The band was very good and the dancing was great fun. Photo H.D. Oschadleus On Thursday morning John Cooper, Fernando Spina and I had afternoon flights out of Edinburgh so we had the morning to explore more of the city. 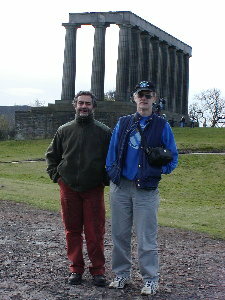 Our first stop was Calton Hill, from where one has views over the Firth of Forth, the Castle and other parts of the city. The half finished Parthenon was conceived as a national monument to those who died in Napoleonic Wars - building started in 1822 but funds ran out so it was never completed. Photo H.D. 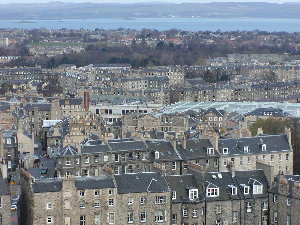 Oschadleus View of New Town (note the Georgian urban architecture) from Calton Hill (with the Firth of Forth in the background). Photo H.D. 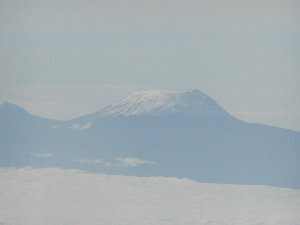 Oschadleus I flew back to Cape Town via Nairobi, making it a longer flight than a direct flight but one consolation was the views of Mount Kilimanjaro.